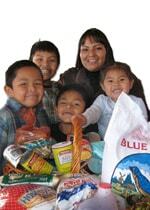 The Southwest Indian Foundation Housing Project has continued to expand for the last ten years. Our first new homes were built at the Air Force Academy in 1998. SWIF has worked with many military, Tribal, and Government agencies to find adequate housing for homeless families and individuals in the Four Corners area. Former President Kelsey Begay of the Navajo Nation has stated that the Navajo Reservation is 20,000 housing units short of actual capacity. Our challenge to us is to help provide safe and decent housing to those in families and individuals that would have no way of obtaining a home without outside assistance. SWIF is concentrating of the most dire cases -- essentially the "poorest of the poor".